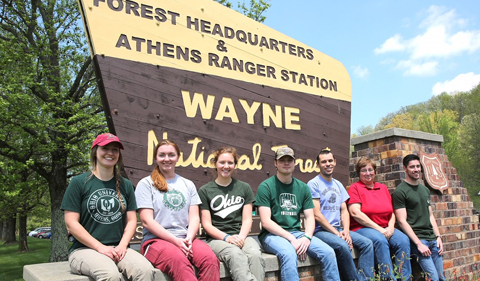 Ten Ohio University students are spending their summer gaining invaluable hands-on experience as they intern at Wayne National Forest. The majority of the interns’ time will be spent assisting with two major Wayne National Forest initiatives—the Bailey’s Mountain Bike Project, where student interns are “integral” to the creation of the trail, and the Long Ridge SE Oak Project, which will reestablish oak trees. 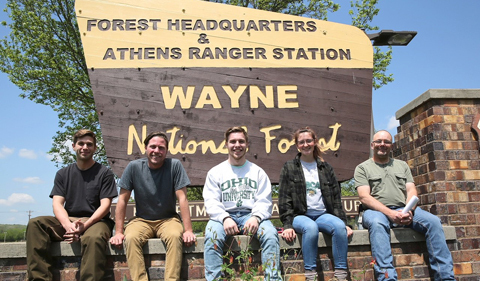 The students, who are part of OHIO’s Anthropology, Environmental & Plant Biology, and Biological Sciences departments, will spend 12 weeks searching for endangered species, studying habitats, and surveying Wayne National Forest land. The internship program between OHIO and the Wayne began in 2017, and members of the partnership agreed that they were excited to continue the program in 2018. “Last year, interns surveyed 36 miles along the proposed trial, and things went really smoothly. The students accomplished a lot of work, so we’re glad that the program is back this year,” Wayne Safety Office Mike Buchanan says. 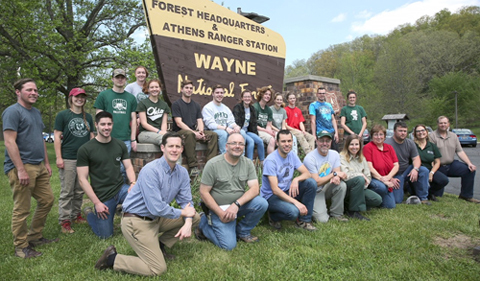 2018 Interns, OHIO Faculty, and Wayne National Forest staff. OHIO faculty Harvey Ballard, Viorel Popescu, and Paul Patton, who were each involved in the internship program last year, continue to partner with the Wayne for this year’s initiatives. Ten new interns will work on the Wayne this summer, with three OHIO alumni and graduate student advisers: Zach Matthews ’17, who earned a B.A. in Anthropology and is currently pursuing a master’s degree in Environmental Studies; Harlan Svoboda, Ph.D. candidate in the Department of Environmental and Plant Biology with a specialty in plant systematics, and Julia Golias 16, who earned a B.S. in Biological Sciences-Wildlife and Conservation and works in the wildlife conservation lab at OHIO. “The adviser position will allow returning students to bring their wealth of experience to the new interns and help them be successful,” says Lisa Cohen, Director of External Relations for the College of Arts & Sciences at OHIO. The advisers will provide job shadow assistance in multiple areas, including help with reporting the interns’ findings at the end of the summer. Matthews, an OHIO alum, counts it a privilege to help the current crop of students acclimate to their internship responsibilities. “Last year I really enjoyed going through practical field methods and laying down mechanics in a real-world setting, rather than an academic setting. I’m very excited to come back this year and guide students,” he remarks. The 2018 Environmental and Plant Biology team. 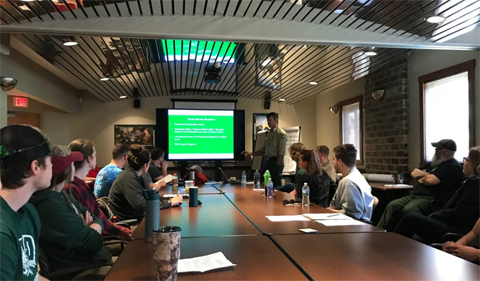 Rising senior John Knavish ’19, a Plant Biology major, explains that the internship provides unparalleled involvement with the operations of a national forest. “I’m so excited to get some experience in my major and to see up-close what habitat management really is. We’ll get to learn what day-to-day functions at the Wayne really involve,” he says. The Wayne internship program affords students not only excellent hands-on experience but also the opportunity to publicize their findings. Students’ photos and inventories can be used for statewide projects and listings, for example. The Bailey’s Mountain Bike Project, which will culminate in the development of an 88-mile bike trail, is a continuation of last year’s work. OHIO student interns are integral to the creation of the trail, explain Wayne Forest Ranger Jason Reed, Athens District Ranger at Wayne National Forest, and Dawn McCarthy, Wayne Partnership and Community Engagement Specialist and an OHIO alum who earned a Ph.D. in Plant Biology in 2009. “Wayne National Forest is coming into the national spotlight, and our student interns are a major part of that,” McCarthy says. Athens District Ranger Jason Reed leads orientation. “Students are involved in the first step of the trail’s creation. The interns are our boots on the ground; they examine what the Bailey’s Project is affecting and how to mitigate those effects,” McCarthy states. “We need to make sure our project isn’t threatening any species. The students will help us determine how to minimize erosion, how water is going to cross the trail, and whether culverts are necessary, for example. Last summer, the interns identified some species of rare plants, so we moved the trail to steer away from those types of sites,” she adds. 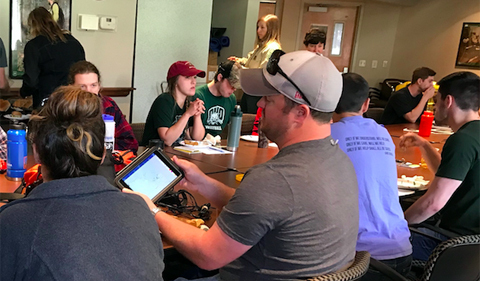 Students will assist with several land surveys that last the length of the growing season, in addition to studying native and non-native species, notes Wayne botanist Trey Scott. Learn more about the Bailey Trail System via YouTube. In 2017, the interns surveyed 36 miles of forestland as part of the Bailey’s project. This year, the interns will need to examine a considerably larger area—a total of 52 miles, says Reed, the Athens District Ranger. The current cohort of interns will survey farther north and will differentiate between advanced, intermediate, and beginning bicycle trails, as an important part of the project is ensuring that trails are available to people of all levels of experience and ability. The bike trail will also be “a huge economic boon” for the area, Reed adds, with the expectation that it will bring in more than 181,000 cyclists annually to the Wayne area. “The hope is that if we’re able to create a destination-worthy attraction and connect the trail to small towns in the area, that will provide a means for those small towns to grow. The Bailey’s project is definitely tied to economic development,” Reed explains. OHIO senior Emily Uhlman is one of the interns who will work on the Bailey’s project. A Field Ecology major, Uhlman is part of the university’s Environmental & Plant Biology Department. The Long Ridge SE Oak Project, the second major initiative for the Wayne and the interns, is intended to promote land management across boundaries, Reed explains. This project is the first in a series of steps to help reestablish oak trees in the area. The oak project covers approximately 3,000 acres and involves prescribed fire and mechanical treatments to help maintain the oak ecosystem. Interns and Wayne getting acquainted at orientation. 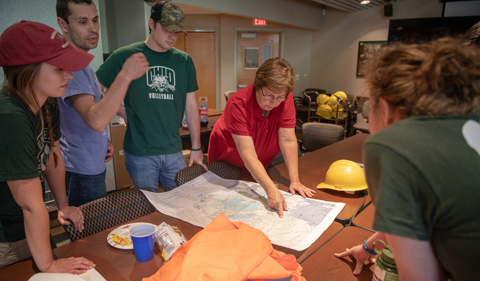 OHIO interns will assist with several aspects of the Long Ridge SE Oak project. Primarily, they will study the designated area to determine the types of invasive species that exist and what problems those species are causing. Reed notes that students will also help determine whether there are any means for the oaks to become reestablished without human intervention. Like the Bailey’s Mountain Bike Project, the Acorn Project initiative has important financial and biological implications. Reed explains that a high percentage of the volume of wood harvested in Ohio comes from oaks, and more than 90 wildlife species use acorns in some way. Thus, students’ work on this project will have several significant benefits. Though the students will spend the majority of their time working on the Wayne’s two main initiatives, they will assist with several other projects over the course of the summer. The Wayne has entered into a new Memorandum of Understanding with United States Fish and Wildlife Services, which will help with the management of wild buffalo clover populations, Scott explains. The student interns will assist with a special two-day survey for this species. “This survey will contribute to USFWS’s future removal of wild buffalo clover from the endangered species list, which we hope will take place within one year,” he adds. Meanwhile, interns also will examine habitats, especially for sensitive species of mammals, birds, invertebrates, and aquatics, notes Lynda Andrews, Wayne Wildlife Biologist. The students will receive training in how to look for tracks, how to spot scratch/bite marks, and methods for listening for calls from treetop birds. Students also can volunteer with time-sensitive projects over the summer, such as an initiative that involves night calls for whip-poor-wills. Archaeology students from OHIO’s Anthropology program will help survey the land to identify and protect prehistoric burial mounds, structural remains, Underground Railroad sites, Native American artifacts, cemeteries, and other important elements of the local landscape, explains Wayne archaeologist Chris Euler. This type of surveying is a major draw for the program’s archaeology interns. “I wanted to see what these sites contain and how the surveying process works,” says Ben Johnson ’19, a rising senior in OHIO’s Anthropology department. The Archaeology Intern team from Anthropology. Interns will receive training in using mapping equipment that enables them to identify cellar holes, foundations, and wells, which generally mark former housing sites. Interns also will inspect sites for looting and vandalism. 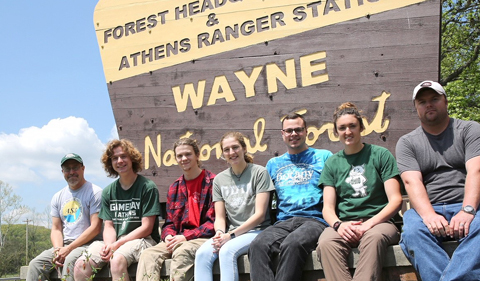 The Wayne National Forest team has been terrific about offering students job shadowing opportunities so that students are able to learn about a broad spectrum of career pathways, Cohen noted. “If you’re interested in law enforcement on the Wayne, you might meet with a law enforcement staff member on a rainy day when you can’t survey,” Cohen suggested to students. In short, the opportunities for interns are endless. Wish they had a program(s) like this when I was an undergrad (1968-1971)!